House Education Committee Chair David Sharpe (D-Bristol), right, and committee member, Rep. Kevin Christie (D-Hartford) listen Tuesday to debate about the education spending cap. Instead of voting on the issue, House Education Committee members hunkered down in the committee room, grinding anew through spreadsheets. Meantime, political candidates used the unsettled issue to score political points, while local school officials found themselves saddled with a new layer of confusion. Mark Perrault, analyst with the legislature's Joint Fiscal Office, explains issues with a spending cap to the House Education Committee on Tuesday. 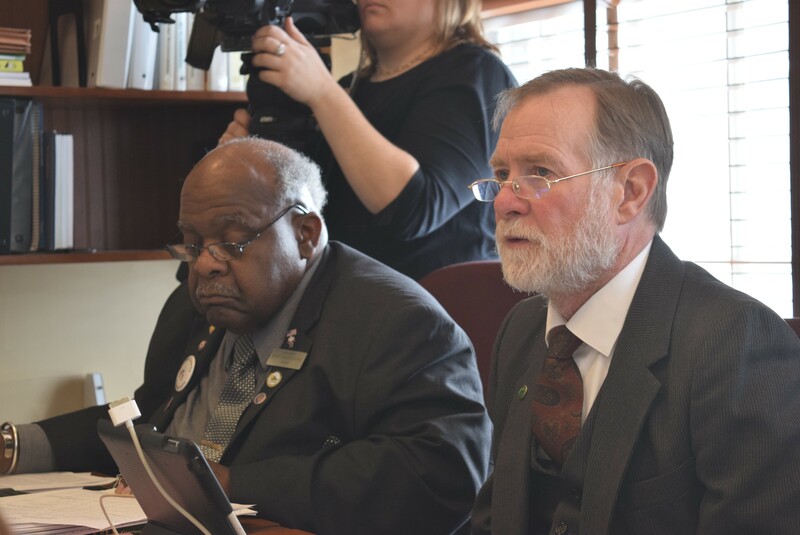 “It’s a mess,” said Rep. David Sharpe (D-Bristol), who chairs the education committee. He pulled a bill off the House floor Tuesday morning and reassembled his committee to consider the discovery that school districts had been sent incorrect information about spending caps. Lawmakers had already been mired in uncertainty, trying to decide whether to repeal or revise the spending caps, after districts complained that they hurt some low-spending districts more than high-spenders. The mess deepened Tuesday after it became clear that the Agency of Education had sent school districts inaccurate information about what kind of expenses fall under the spending caps, leaving them with bad data on which to build their budgets. Lawmakers had intended the caps to exclude items such as school construction and unusual special-education costs, but the agency didn’t allow for those exclusions in information sent to school districts. Bill Talbott, chief financial officer for the Agency of Education, said the agency misunderstood the legislature's intent on exclusions. Because the issue is highly technical, the discrepancy didn't become clear right away, he said. The agency sent school districts revised information Friday, then followed up later that day with clarifying details after the first update generated confusion. 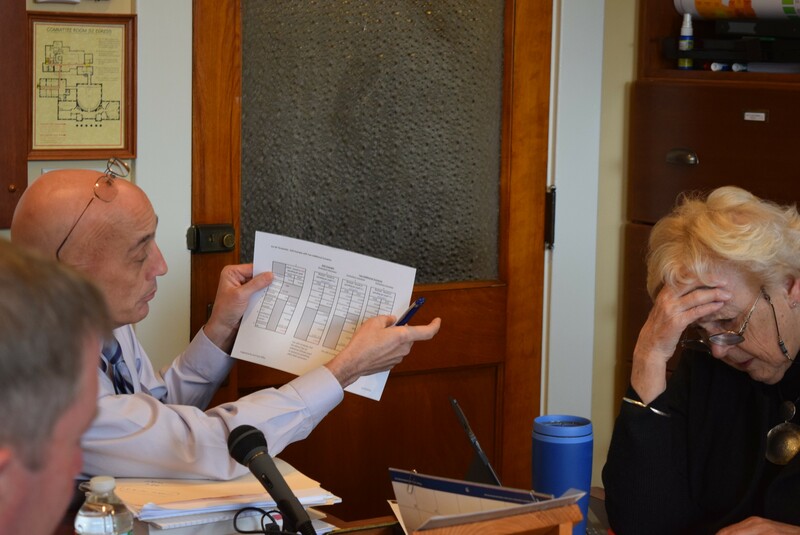 The turmoil comes as many districts are finishing their new budgets in time for Town Meeting Day votes in March. Mark Perrault, analyst with the legislature's Joint Fiscal Office, characterized the issue as not a major concern in the state's overall school-spending picture, but he said some school districts could be significantly affected. It was unclear which ones, he said, as that depends on what construction projects and other expenses they happen to have. Tuesday morning, the Senate voted unanimously to repeal the threshold altogether, a move they had in the works before the newest confusion. But senators voted knowing that the issue was far from over because their counterparts in the House are more divided. Down the hall in the House, some members also want to repeal the caps, but others feel strongly that the caps are working to force school districts to reduce spending. The issue crosses party lines, with no agreement about what should be done, according to Rep. Sarah Copeland Hanzas (D-Bradford), the House majority leader. If lawmakers repeal the cap, as the Senate and Gov. Peter Shumlin want to do, the mistaken information from the agency won’t matter. Sharpe has strongly resisted repealing the caps, but he conceded Tuesday that new uncertainty over information being sent to school districts could make that option harder to resist. “I hate to phrase it that way, but certainly there’s going to be more pressure,” Sharpe said. That push to eliminate the caps was on display at noon Tuesday, when eight House members held a news conference calling for repeal. Rep. Kesha Ram (D-Burlington), a candidate for lieutenant governor, organized the event. She voted for the spending caps last year, but said she now sees them as problematic. As the news conference wrapped up, her Democratic primary opponent, Sen. David Zuckerman (P/D-Chittenden) passed by. He had just led the Senate through its vote to repeal and noted that he has long opposed the caps. Zuckerman buttonholed Rep. Robin Chesnut-Tangerman (P-Middletown Springs), who had stood with Ram at the news conference. “Political opportunist,” Zuckerman was overheard telling Chesnut-Tangerman in reference to Ram. Later that afternoon, Sharpe was still trying to find a solution that did not include repeal. His committee voted 11-0 last week to raise the level of the caps by 0.9 percent, hoping to keep some spending controls in place. Tuesday, he hoped to come up with an approach that worked around the inaccurate information issued by the agency — one that would allow districts to develop budgets based on either interpretation of what expenses fall under the spending cap. By the end of the day, Sharpe had yet to find agreement. “Not today,” he said as he walked into the House speaker’s office.